Some affiliate links are included for your convenience. Click here to read the full disclosure. 2×12 piece of wood cut to desired length. Mine is 3 feet long. Pick your wood, cut to desired length, and sand. I bought an 8 foot long 2 X 12 plank and had it cut in three sections. Two were 3 feet long and one was 2 feet long. I used one of the 3 feet long pieces. This wood is about 2 inches thick. I wanted it thick and chunky to make it sturdy. This is the 3 feet long piece all sanded down and ready for stain. 2. Apply stain using a rag. I chose Minwax Early American Wood Stain It is light and classy! 4. 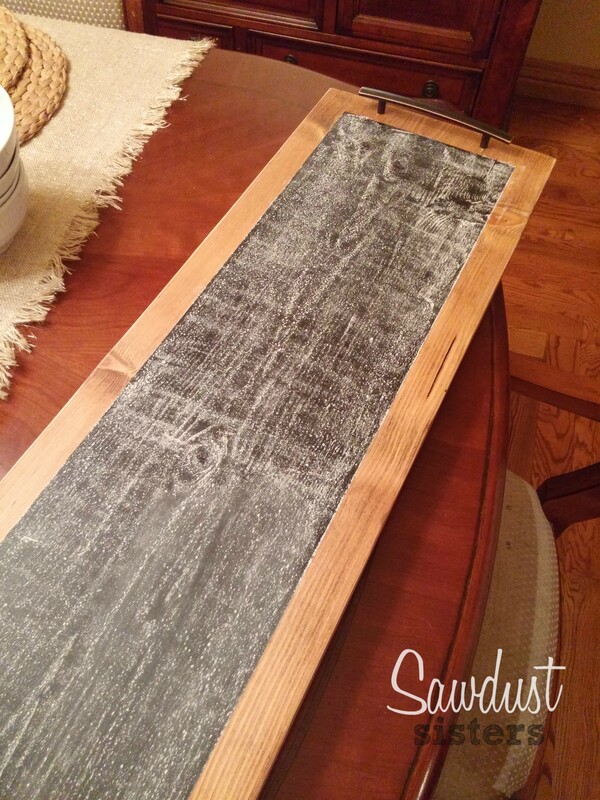 Use a Foam Roller and apply two coats of Chalkboard Paint Wait about 10 minutes between coats. You may do a third coat if needed. 5. Remove tape carefully. Isn’t she pretty? 6. Drilling time. Take your cabinet door pulls (you need two of them), place them on desired location, and mark where you need to drill. My pulls were big – the screws were 5 inches apart – but you may use smaller ones. Just look for something that can comfortably fit your hand when holding up the tray. This is the underside of the tray. I drilled the holes from the top and then inserted the screws from behind. The screws are pocking out just enough to be inserted into the pulls. Done! Now do the other one. 7. 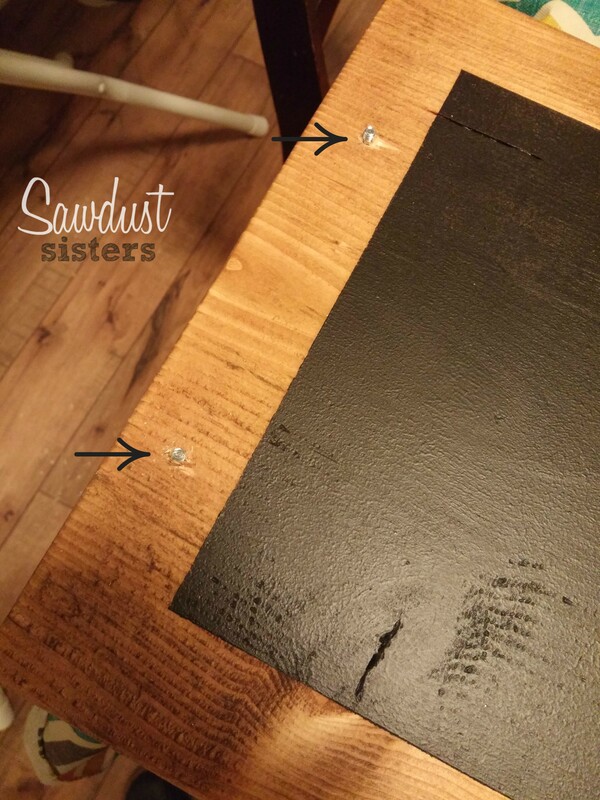 Place the Felt Pads where the screw heads are showing to protect the surface where your tray will be sitting. 8. Season the tray. Take a piece of chalk and cover the whole thing with it. 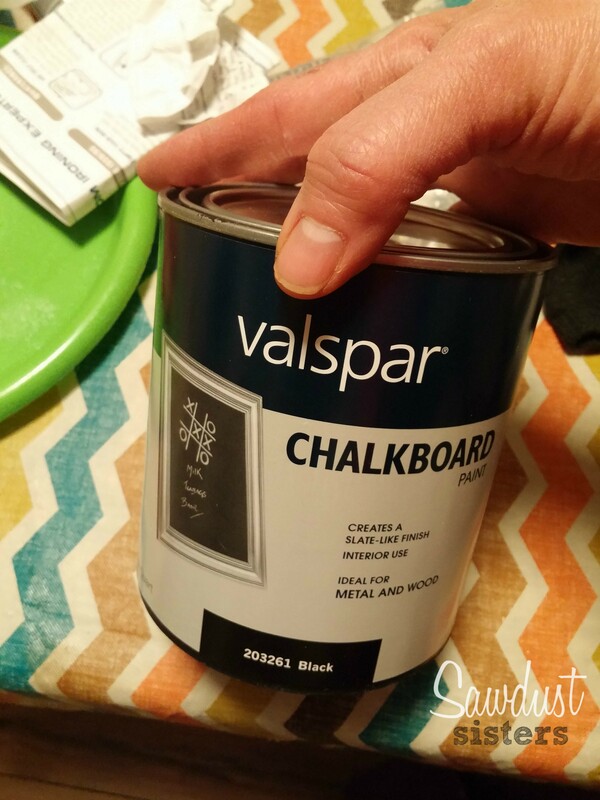 This is going to prepare the new chalkpaint to be erasable. If you don’t season it, you will be able to see writing marks after erasing. 9. Erase with an erase board to get excess chalk off, and then use a damp cloth and wipe the surface clean. 10. Guess what? You are done! How about displaying and labeling toppings for an ice cream bar? Or maybe a Taco Bar? 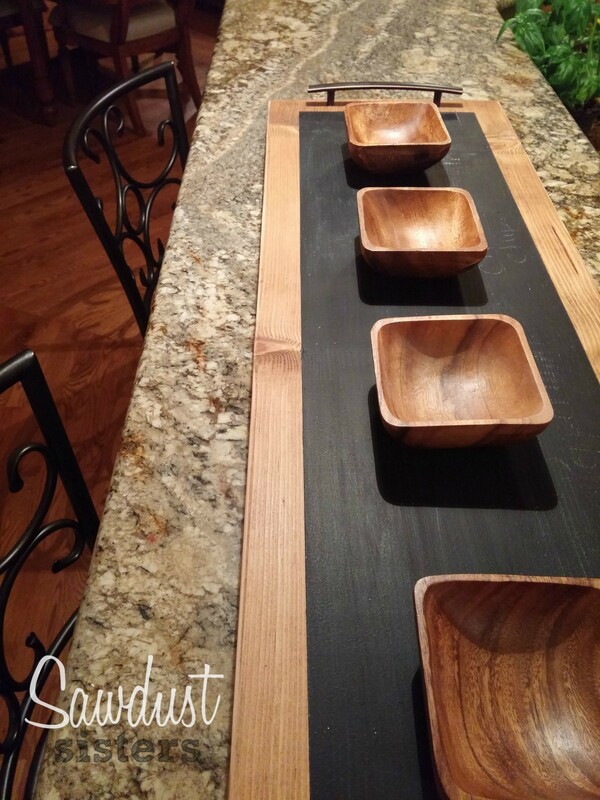 Imagine displaying your guacamole, pico de gallo, cheese, and other toppings, on this cute wooden tray. Let’s get the party started! The possibilites are endless! You could mix and match different bowls and plates depending on what you are serving. I am already thinking I want to make a couple of these for a few weddings I have coming up. Who would not want to receive this beauty as a gift? The easiest tutorial ever, right? Let me know if you have any questions! And thank you, Shanty-2-Chic for the inspiration! We loved the idea too, thanks!